SOUTH-TEC attendees will be among some of the first to see the new BobCAD-CAM Version 28 and Mill Turn CAD-CAM software at this year’s trade show circuit. We’ve continued to work closely with our clients to make some major upgrades and additions to the core software. We’ve also debuted our completely new software module for CNC mill turn machines. Developers and Technical Advisors from BobCAD-CAM will be on hand at the company’s booth (#741) to provide one-on-one demonstrations of the new software and offer detailed walkthroughs of new features. There will also be daily group presentations and Q&A sessions at the booth. Additionally, the release offers all-new Mill Turn CAD-CAM software that supports CNC mill turn / multitasking machines. The Mill Turn module allows for programming of multiple turrets, multiple spindles, steady rests and supports live C axis milling, Y axis milling, and B axis (5 axis) milling heads. With the addition of Mill Turn capabilities, the company’s software now works with nearly every type and configuration of CNC machine in use today. SOUTH-TEC begins Tuesday, October 27, 2015 and runs through Thursday, October 29. Full demonstrations are available at the BobCAD-CAM booth #741 at the Charlotte Convention Center. One-on-one demonstrations are available for walk-ups or they can be pre-scheduled by calling 877-262-2231. Those interested in attending SOUTH-TEC can receive free admission by registering at Southteconline.com using promotion code 10731497. 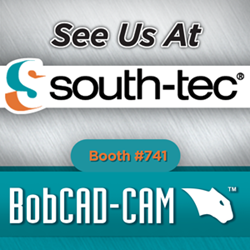 SOUTH-TEC attendees will have access to show exclusive CAD-CAM product specials – available through the end of the show. BobCAD-CAM Version 28 software and new Mill Turn module demos are available for download at the company’s website BobCAD.com. For 30 years, BobCAD-CAM has been dedicated to designing powerful, user-friendly and affordable CAD-CAM software. BobCAD-CAM products are used in CNC machine shops and schools all over the world - helping to automate the programming process for mill, mill turn, lathe, router, plasma, laser, waterjet, and wire EDM CNC machines. They provide solutions for CAD, artistic CAD, nesting, solid machine simulation, custom g-code post processors, comprehensive training, and support packages.